Quite simply, these are the very best Gardening Gloves you can buy! The WINTER TOUCH™ Gardening Glove is a truly unique, hardwearing, yet luxurious glove for use in cold or wet conditions. This glove features a Thinsulate™ thermal lining to keep your hands warm even in the coldest weather, but also benefits from an additional innovative Ski-Dri™ waterproof, breathable lining which ensures your hands remain totally dry when used in the wet! The WINTER TOUCH™, as you would expect, is designed to offer extra comfort and durability throughout the colder, wetter months of the year, keeping hands warm and dry during all general gardening tasks. The reinforced palm of this glove also makes it ideal for use with rakes, spades, brushes and a whole host of other gardening tools. Also available in ladies' size. The Most Comfortable and Best Fitting we have seen! This brand new range of gardening gloves is causing quite a stir in the gardening world. Not only are these gloves are coming top in gardening glove comparison reviews in gardening journals, they have also received a prestigious Certificate of Merit for outstanding display at the RHS Chelsea Flower Show, and been awarded the top exhibit prize at the "BBC Gardeners World Live" event. So what could be so special about a pair of gardening gloves? - afterall, gardening gloves have been around for over 200 years. Well, quite simply, these are the very best gardening gloves you can buy. 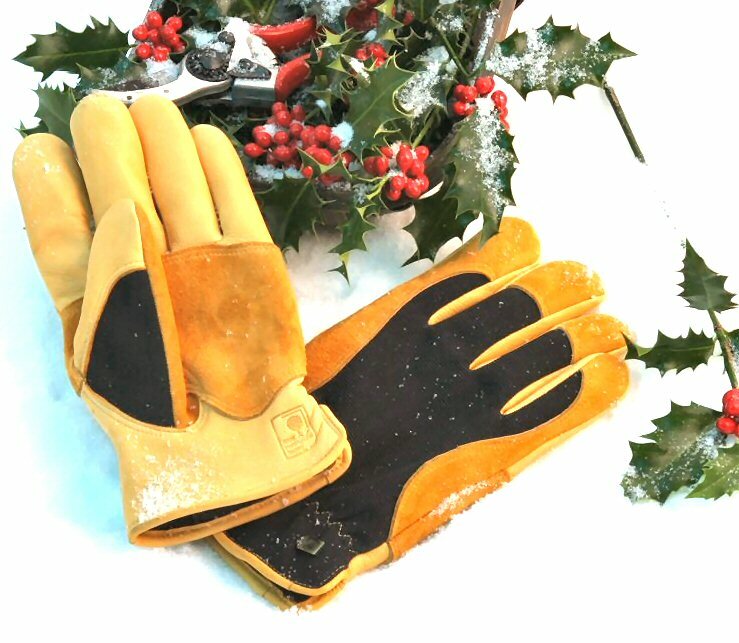 They represent a departure from traditional glove design - for a start, unlike most gardening gloves, which are made from industrial grade leather, these gloves are made from exceptionally high quality leather (usually only seen in very expensive fashion gloves), which is both comfortable and durable. Secondly, alot of work has gone into the design of these gloves to make sure they fit better than other gloves - and they really do fit better! The ladies versions of these gloves are particularly outstanding in this respect. 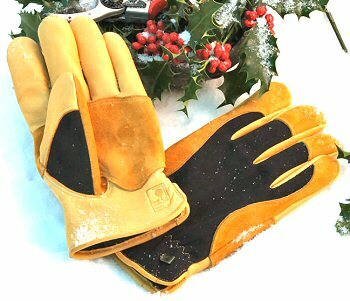 Thirdly, these gloves manage uniquely to combine durability with "feel" - you will find that these gloves offer far more dexterity than other hard-wearing gloves. There are a number of inadequacies with most gloves currently available: POOR FIT: gloves currently being sold as gardening gloves often do not fit very well, particularly those sold as ladies. UNCOMFORTABLE: many existing gardening gloves can be fairly cumbersome and uncomfortable - for example, gloves marketed as pruning gloves are often not gardening gloves at all, but welder's gauntlets or industrial drivers gloves, packaged as gardeners gloves. NO FEEL: there is limited dexterity in most of the current products, resulting in a lack of feel, because often the leather used to make these gloves is industrial grade leather which tends to be fairly low in quality. UNATTRACTIVE: the appearance of most current gardening gloves leaves a lot to be desired. The new Gold Leaf Gardening Glove range solves all of these problems, by bringing together some unique and innovative designs, made from exceptionally high quality leather (usually only seen in very expensive fashion gloves), which is both comfortable and durable. Once we have sent your gloves we will email you dispatch confirmation so you will know when to expect it. Delivery of this product will usually be next day if you order before 12am. Deliveries will take place usually between 9am and 5pm, Monday to Friday (excluding Public Holidays).